Wanna see your name on the back of a Toronto Blue Jays baseball jersey? With the help of PersonalizedThings by Exposures, customizing our epic sports decor is easy. Just specify your preferred name or nickname up to 12 characters. We'll create this vibrant print just for you! With its classic Jays team colors, team logo and ready-to-hang convenience, this piece is sure to spruce up your fan cave all season long. 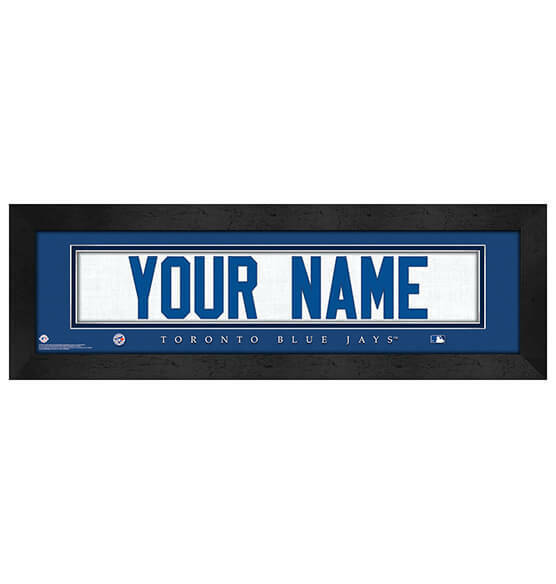 Great for either your home or your office too, you can celebrate the pride and joy of the "6ix" anywhere with the help of our officially licensed MLB memorabilia.